FREEDOM TO MEASURE ANYWHERE, ACCURATELY. Precise enough for the professional, easy to use for everyone. Take control of your local weather impacts with accuracy to World Meteorological Organization (WMO) standards with this wireless all-in-one weather station. Based on the MeteoShield Professional which was awarded the Creativepool Annual 2018 People’s choice award for product design. 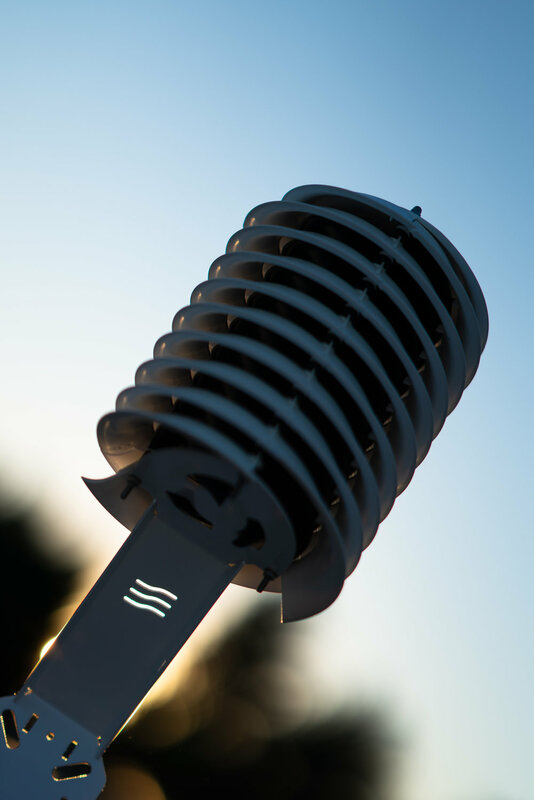 MeteoHelix design takes advantage of the precise measurement qualities of the MeteoShield Pro which were highlighted to be the best in an independent comparison by the Royal Meteorological Institute of Belgium. (“Intercomparison of Shelters in the RMI AWS Network”). Excels in agricultural and urban climates. It is more accurate than even professional fan-aspirated solar shields and screens from the Intercomparison of Shelters in the RMI AWS Network”. The only professional automatic weather station (AWOS) to meet WMO requirements is available in Sigfox and LoRaWAN IoT wireless versions. Manage your weather data and weather station settings in one place and export your backed up data to your favorite weather portal or analytical software. Built inside the MeteoShield Professional, it is also well suited to provide high quality measurement in extreme climates with snow cover and with hot desert sun. Helical design catches dirt on the outside and keeps internal sensors clean. On the farm or in the city, your data will stand out. New wireless technologies and new helical design let us make professional measurement simple. activate once with a magnet, then Just mount on a wall or pipe with u-bolts. data is sent automatically. Install the MeteoHelix with one robust universal mount, activate by a magnet and the internal battery and solar panel will keep it running for years. Micro weather station customer installation pictures. Agricultural weather station with a rain gauge on a livestock farm in Ireland. Agricultural weather station on a livestock farm in Ireland.